(Newser) – Colin Kaepernick's national anthem protest has spread to soccer: Megan Rapinoe, a Seattle Reign midfielder and member of the US women's national team, knelt for the national anthem before her team's 2-2 with the Chicago Red Stars on Sunday, Mashable reports. The 31-year-old, who has been on the US team for 10 years, including their 2015 World Cup win and Olympic gold in 2012, says the move was a "little nod to Kaepernick and everything that he's standing for right now"—and she plans to keep it up. Another fu*king disrespectful POS athlete! Way to set a piss poor example to the young fans who look up to you. Hope she gets the shaft like Ms. Solo. 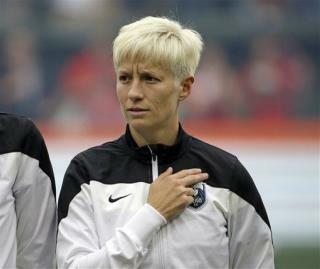 If Rapinoe does not like this country, she should find a better one and go there. I wish her well; and I wish her gone, particularly from the national (as in USA) soccer team.